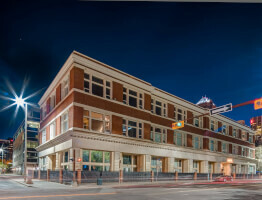 he Hudson is the oldest warehouse in Calgary that has been converted to mixed residential /commercial lofts, originally constructed in 1909 by the Hudson's Bay Company. Steeped in history that includes Canada Safeway Ltd, some of the key loft elements here include large wood beams & columns, exposed red brick exterior walls and a gorgeous wood slat ceiling. The kitchen features recycled oak cabinetry with under cabinet lighting, granite countertops & high end stainless steel appliances including a Viking Induction Range & Sub-Zero Freezer. This east facing unit boasts views of the downtown skyline, maple hardwood flooring, insuite laundry, two Juliet balconies accessed through French doors & fully renovated bathrooms, with a Kohler cast iron tub in one. Two parking spaces are also included with one titled and the other leased. 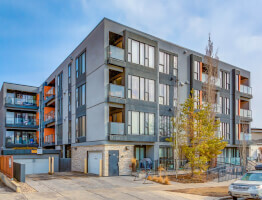 Located blocks from the city core & 17 Avenue; some of Calgary's best shopping, dining & nightlife are close by.